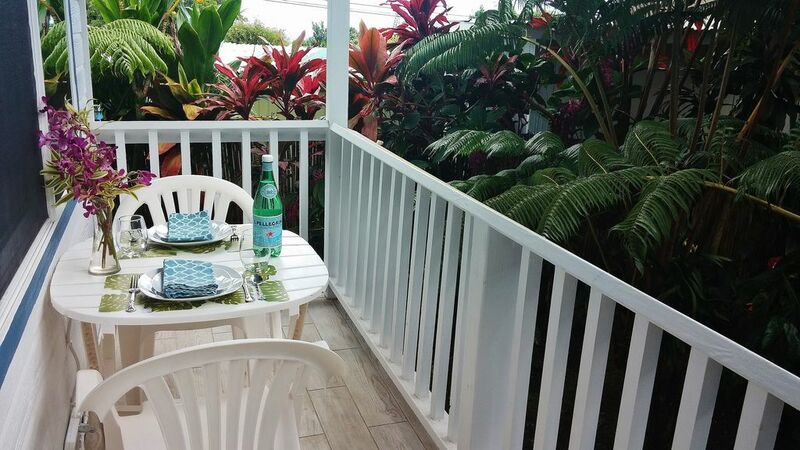 PARADISE COTTAGE is a newly constructed, fully appointed and decorated "Tiny House" tucked securely to the rear of Anthurium Hale's main house in the hills of Hilo town. The completely private; entry is through a breathtaking botanical garden, past a koi pond and over an arched bridge, onto a lanai that offers a peak at Hilo Bay. The cottage features high ceilings. is decorated with antique and collectible arts, furnished with every imaginable item that you might wish for, even thirsty terrycloth bathrobes and spa slippers. Your kitchen features a variety of dishes and an array of small appliances so that you may create your own pallet pleasing meals and treats. To start you off, you will receive our Aloha Basket of fruits, coffee/teas and other essentials. The bed is queen size and the living room provides comfortable viewing of a 32” cable TV. The lanai offers an environment to “die for", a pull down shade for privacy or shelter from the rain or simply reach out and touch the ferns while gazing at the flowers in the garden around your own private koi lagoon. The pond and walk way glow after dark with gardem lighting that lends a dream-like ambiance. ………you may be tempted to extend your stay. Hawaii became my home in the 1960s and I have lived in on the Big Island since 2000. Hilo is home to the MERRIE MONARCH FESTIVAL, a huge international Hula competition that is held every April. In my early years I frequently crewed on a charter fishing boat out of Kewalo Basin on Oahu which gave me the opportunity to travel by sea throughout the islands. I have visited them all, with the exception of Kahoolawe and Molokini and have crossed the channels more times than I can count. I have two children, growth and on their own. I am the owner and operator of the online antiquarian entity, MANDARIN BOOKS HAWAII that deals exclusively in rare and vintage Pacific Isle books and art. ( This interest, fueled by a bit of passion for the sea has further culminated in my "sailing" on a cruise ship from the mainland to Hawaii in the 70s and more recently, crewing from Hawaii to French Polynesia on a 38 foot sailboat. I also spent several months sailing in the Bay of Islands, New Zealand followed by a passage from NZ to American Samoa on a 43 foot s/v. I have had the privilege of traveling on the mainland, Canada, Italy, Portugal, Japan, France and the Czech Rep..
After living in a Honolulu condo for decades we decided to get away from the city by moving to Hilo. It provided a wonderful small town environment along with the University of Hawaii from which my son graduated in 2005. The property has changed much since our acquisition. We value both convenience and privacy, something that is not easy to come by when one is only 3 miles from the mall and modern shopping conveniences.. I am a lover of exotic birds and flower, the sounds of nature and flowing water, i.e. our two koi ponds. We felt this property had potential to become our own little paradise. The cottage which was recently completed was constructed to match and compliment the main house. Our bathroom has a bit of a tropical feel, featuring an abundance of colorful towels. We are in a private residential subdivision in Hilo town proper. The location is convenient to all areas of Hilo plus the Saddle Road to Waimea & Kona or Hwy 11 to Volcano or Kalapana. A small peak at Hilo Bay from the Living Room and Lanai. Air Conditioning via Two Ceiling Fans plus one box fan..
Clean linens always. Pillow slips pressed. For guests staying longer than 7 days, complimentary housekeeping services with be scheduled at your convenience mid-way through the visit. Free Off Street Parking space reserved for cottage guest. Up 3 garden steps and walk to Cottage at the rear of the property. Guests should be fully ambulatory. Cart available for bags. An abundance of towels is provided, plus terry bathrobes and spa slippers. There are no extra charges for using they items. Apartment sized Refrigerator with separate Freezer. Two European type burner cook-top. Coffee, tea, salt, pepper, shoyu, oil. Includes of dishes, pots & pans, coffee maker, food processor, blender, rice cooker an array of utensils. Fully equipped Mini-Gormet Kitchen that includes basic condiments. Welcome basket on check-in. Meals may be enjoyed on the mobile tablet unit or on the lanai table. There is also seating at the table in the garden. A small Pacific Island Antiquarian Library courtesy of Mandarin Books Hawaii. Private bontanical garden with giant Hawaiian Hapu'u and an assortment of tropical flowers. Entry to Cottage over Arched Bridge onto Lanai (balcony/deck.). We are delighted to welcome Seniors, but very good physical motility is required. Completely private; entry is through our breathtaking botanical garden, past a koi pond and over an arched bridge to your residence. Perfect for a romantic weekend get-away or an extended period to relax, reflect, work or play. Just possibly the perfect Author's sanctuary. Nice place to stay, good location, very clean. We enjoyed our stay. Jean was very helpful. The cottage was well decorated and very clean. The owner was extremely helpful and friendly, a welcome basket was provided that contained local food and essentials along with fresh fruit which was very thoughtful. It's not too far out of Hilo town and we had a hire car so it was a convenient drive to the volcano and other attractions. This tiny house is a lovely place to stay surrounded by a beautiful garden with lots of local birds and a resident turtle. Additionally, Na Hoa Holomoku of Hawaii Yacht Club of Hilo has their sail outing down at Hilo Bay on the 1st and 3rd Sunday mornings of the month with lessons provided on the 1st Sunday. Please contact the club directly to additional info. Viewing of Kilauea Volcano & dinning at the Kilauea Lodge in Volcan National Park. 30 miles. Visitor Center near the top of Mauna Kea with views clear to Maui on a clear day. 40 miles. Akaka Falls on the Hamakua Coast in Hunamu. There us a lovely 1/2 miles walk down to the falls along with lots of interesting shops for gifts and treasure hunting. World Bntanical Garden for Ziplining..
Lapahoehoe - Historic site, village completely wiped out during the 1946 Tsunami. Antiquing in Honokaa just up the Belt Road on the Hamakua Coast.